I noticed these shoes yesterday, at the end of a highway off-ramp. I couldn’t shoot them, since I’d taken a picture at dawn, but I figured I’d hit it today. There was some grungy snow around them yesterday, which might have been nice, but today’s sunshine melted the last of it. My first thought was to shoot a single shoe with the E-PL5 and 20mm f/1.7 wide open. But I worried that if it was sunny, I wouldn’t be able to shoot wide open. The Pentax K-5 II has a faster shutter and lower minimum ISO, so I figured that camera with the Pentax FA 50mm f/1.4 might be a good choice. 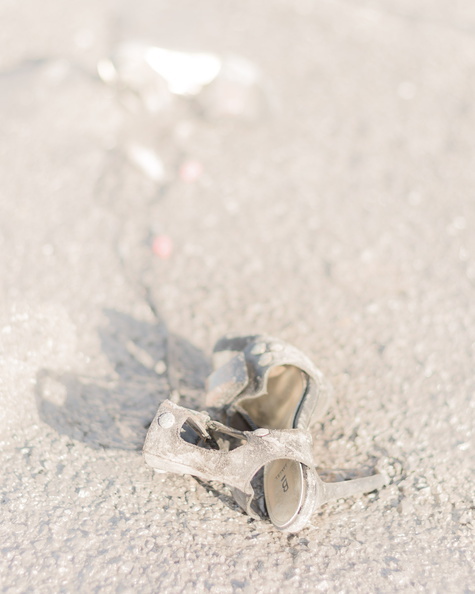 Once I got to the shoes, I saw something I hadn’t noticed from the car: The two shoes were tied together. Instead of shooting a single shoe, I decided to shoot the pair, and take advantage of the leading line formed by the laces. I think this was the right idea, but my execution fell short. The image processing, therefore, became a salvage operation. I first tried cropping out the far shoe, but the results were unappealing. The orientation of the front shoe doesn’t look right by itself in a tighter crop. So I tried a processing technique that’s unusual for me, but makes sense in the “Cinderella” context: A high-key, low-contrast, low-saturation look, which you see a lot in fashion and portrait photography these days. Since I can’t rein in the big bright spot, the idea is to make it blend better with its surroundings. I think it was a reasonable outcome, but not ideal. Well, another day, another frame!